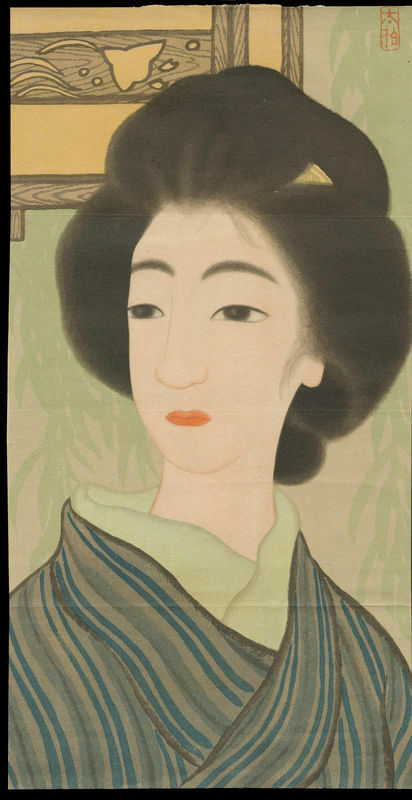 Ishiyama Taihaku (Taisho bijin-ga) "A Serious Expression" - Hybrid lithograph (offset lithograph) - Chinese and Japanese woodblock prints for sale, silkscreen, scrolls, watercolor, lithographs. Artwork Details for Ishiyama Taihaku (Taisho bijin-ga) "A Serious Expression"
Condition: Fine. No creases. Usual kuchi-e folds. Buy two or more from this series/set and receive a 20% discount off each item. Discount and excess shipping cost will be refunded to your PayPal account after your purchases. Cannot be combined with a 'daily discount' (the greater discount will apply). Notes: Rarely seen Taisho-era lithographic print from Kodan Magazine. Very hard to find prints from this magazine series, even here in Japan. See my note on non-woodblock printed kuchi-e prints here. (1) This artwork is either untitled or the title is unknown.